I finished this piece last night, except for the pin back cause I still haven't gotten oxygen for my torch. I mostly like it, except for the holes in the silver part. I regretted it as soon as I finished drilling them. I stuck to the original designs pretty closely, which is unusual for me. Or maybe it's just unusual that I had the design totally finished when I started the piece, rather than starting on the piece with the design only half finished which means I never have an original sketch to compare the piece to when it's finished. 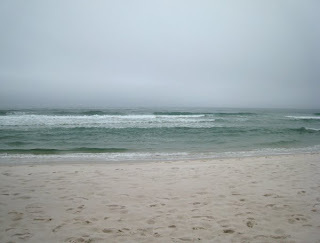 Last weekend I drove to Panama City Beach, Florida for my friends wedding. I was hoping the weather would be nice, but it was overcast the day of the wedding and raining most of the other time I was there. 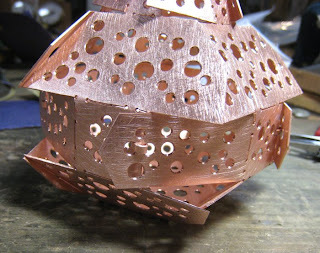 I finished the copper vessel before I left and gave it as a wedding gift. The patina is liver of sulfur. 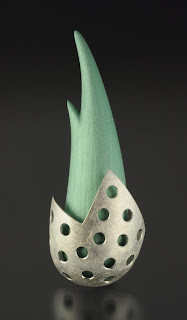 I emailed some one at Jewelry Artist to ask them about the 2009 Jewelry Arts Awards entry form since the 2008 entry form is still up. She said to use the 2008 entry form. Entries are due March 1st. In this picture I have mostly sanded the piece. I do as much finishing as I can while the piece is flat. It's much easier that way. The only parts I cannot finish while it is flat are some of the edges near the center. Even though I have done a paper model, when folding the real piece it is sometimes hard to tell how much each part should be folded, so I fold the piece a little bit at a time. The tabs are what keeps the piece together. This is where I am at right now. 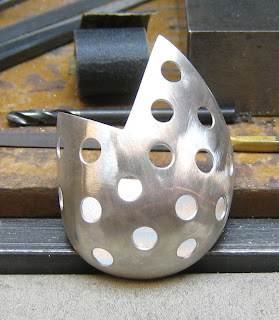 I need to file some edges around the bottom of the piece and put a patina on it. 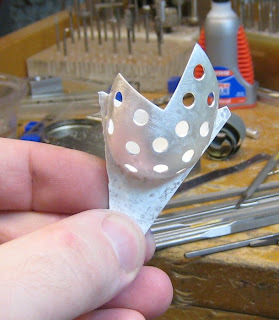 I like it, especially the top, but I am not going to do this exact piece in silver. I came up with one idea for my folded silver vessel. 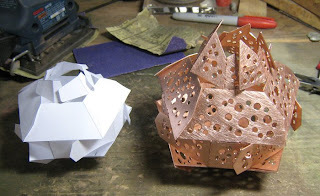 I made 2 paper models then decided to try it in copper since I don't have gas to solder the pin back on my aluminum and silver brooch. 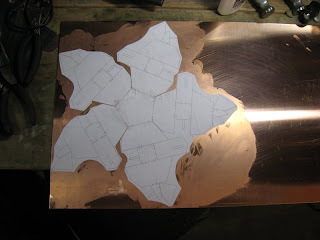 In the picture below I have the design glued to 12" x 24" 20 ga. copper. The design was sized to fit on a 12" x 12" sheet. I use Elmer's School Glue to glue the paper to the metal. 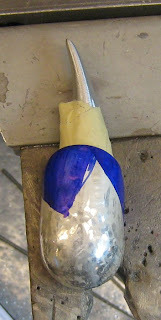 Usually I sand the surface of the metal a little to help the glue adhere to it. This time I decided to skip that step and see if it would still hold ok. Skipping that step was a big mistake. 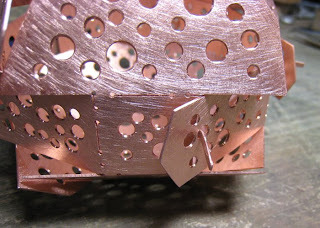 The glue does not adhere to the metal at all. The paper was constantly peeling up while I was trying to saw out the shape and I kept having to glue it back down with super glue, which will be more difficult to remove when I am finished. This is about where I stopped last night. I have almost all the holes drilled and I am deburring them. This piece should be different from the others I have made so far, I am trying something new. Except for the holes. I am getting a little tired of the holes. The silver piece probably won't have holes, or if it does maybe they will be smaller and much closer together. 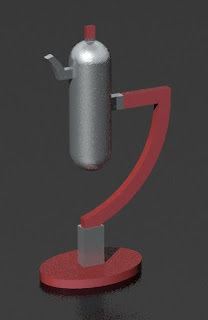 What ever design I decide to use for the silver vessel I will probably not cut it out of a single sheet of metal like I have done with every other folded vessel. 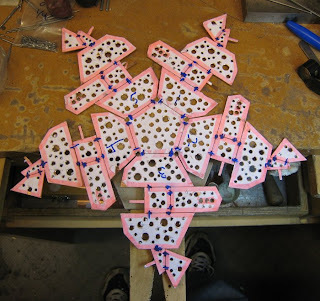 I will probably cut out each side individually then solder them all to a center piece. 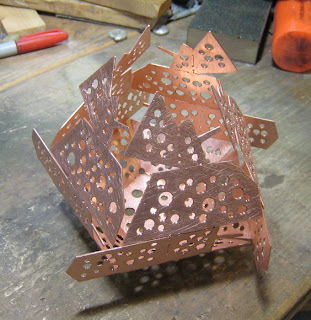 There's lot of waste when I cut the design out of a single sheet of metal. That's ok with copper, brass and bronze, but silver is too expensive to waste. ...and started working on the pin back. In the next photo the pin back part is super glued in place. I like to super glue things together to make sure they will be in exactly the position I want them and then scribe a line to mark where I want it. You can use other things like wax to stick parts together, but I like super glue cause the part will not move at all. The commercial screws in this photo are temporary. 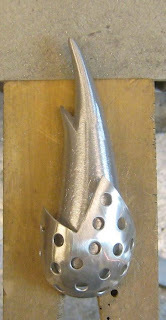 I will fabricate screws out of sterling when I am finishing the piece. The other piece of the pinback is finished, but I forgot to take a picture. Friday I noticed that I was almost out of oxygen for my torch so I decided to get a disposable oxygen tank at Home Depot so I would have something to use till I got my big cylinder filled. After I ran out of oxygen I started using the little tank, but its not providing a steady flow of oxygen, so my torch flame keeps changing. I don't know if it's the tank or the regulator, cause I have only used this regulator once before several years ago. I have never had anything like this happen before. I am trying to resist the urge to start on another brooch I have been thinking of till I finish the one I started last week. I don't have much more to do on it and I don't have any commissions due for a little while so I should finish soon while I have time. 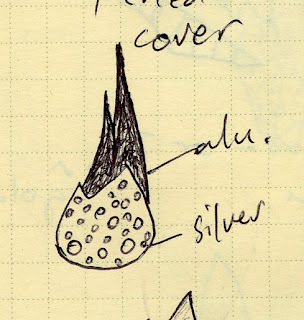 I am also working on a design for another folded vessel I want to make in silver. I would like to make one that is significantly different from the last few I have done. I have some ideas in my head, but it is difficult and time consuming to work the design out. 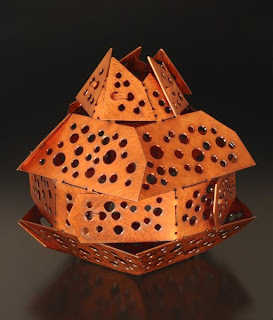 Making these folded pieces is different from my other work because I can't just do a drawing, I need to make a paper model to see how it will fold up. 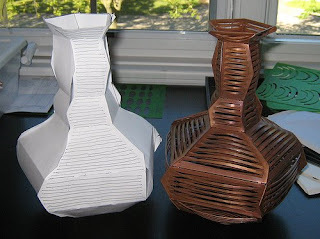 Using CAD has sped up the process, but still I need to print them, cut out the shapes and fold and tape them. Most of the time I see the design is a failure as soon as I finish the model. I thought I had decided last year to make this teapot, I even bought metal for it. But now I am having second thoughts. I was working on some more designs, but haven't come up with anything else I like. I need to hurry up with it because what ever I decide to make I want to have it finished in time to enter in the Cheongju International Craft Competition. Entries probably won't be due till June or July, but a teapot will take a while and I will have a lot of other things to make. Someone told me my Bubble Ring was used in the announcement for the 2009 Jewelry Artist magazine Jewelry Arts Awards in the Feb issue. I went to Barnes & Noble tonight to get that magazine and while I was there I looked at the book The Jeweler's Studio Handbook by Brandon Holschuh which was recently released. Brandon contacted me last year for images of my work to use in his book, so I wanted to see which ones, if any, he used. 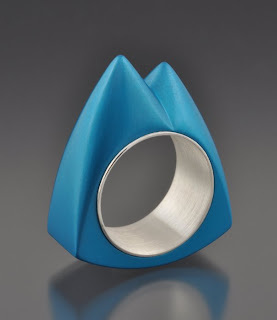 There is a photo of my Bubble Ring in the gallery section. I love seeing my work in print. Unfortunately in the artist listing my website is listed as jonryan.com, without my middle initial, which is not my website. 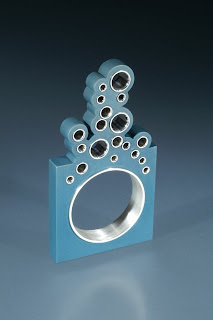 Entries for the 2009 Jewelry Arts Awards are due March 1st. The entry form will be here, but as of today it is still showing the info for 2008. I will enter 2 or 3 pieces. I haven't decided which yet. It's $25 per entry. Its kind of expensive considering there's no actual prize other than having your work published. I made this ring for some one a couple weeks ago. I think the color came out awesome. I did a bit more forming and it is ready to be cut. Cut, filed and sanded, drilled and soldered. This is where I am at right now. The pieces are still separate. I have not yet drilled the holes to attach the silver and I have not made the pin back. After I do those things I will finish sanding the aluminum and anodize it. I really liked the drawing in my sketch book, but looking at the mostly finished piece I don't like it so much. I think it's the holes in the silver, they looked much better on paper. Oh well. I will finish the piece and see how it looks. I might like it more once the aluminum is anodized. I am thinking I will dye it green, but I have not decided yet. I didn't take any photos till I got to this stage. It's ok, there wasn't much to see, I cut it out of 1/2" aluminum with the band saw, and then shaped it with a belt sander till I got to where its at in this photo. 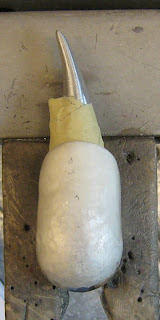 I continued shaping it with a rotary tool and 1/2" cylinder bur. The burs seem to be the best way to shape aluminum, but I am really starting to get sick of getting covered with aluminum and getting aluminum everywhere. Something about aluminum chips I just don't like. 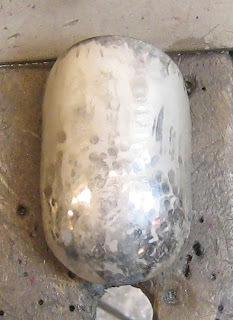 This is the silver piece. Most of the forming has been done. I used something like 22 gauge I think. I was getting ready to cut the silver, but decided to bring the sides of the silver in a bit more. I have the aluminum piece covered with tape to see how it fits in the silver piece while keeping a space between the silver and aluminum. 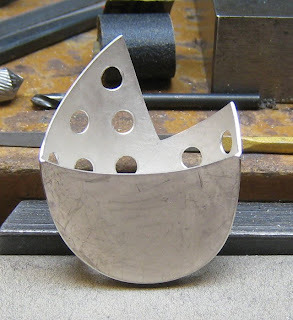 I started a new brooch the other day. I was looking through my sketch book and saw this little drawing I had copied from my old sketch book into my new sketch book in August 2008, the original drawing was from August 4, 2005. It popped out and me and I knew I had to make it next. 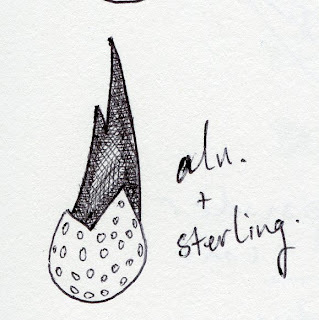 Rarely do I copy the designs in my sketch book as exactly as I did with this piece. Usually I change some things when I start making the piece. About the only change I have made in this is I have made the top part slightly skinnier.